This is literally the Blue Planet - Mother Earth, offered to you on a white platter! This basic globe has a 9-inch ball with a political map, blue ocean color and a functional, easy-to-view plastic stand. Yes, you and your young student will spend lots of quality time poring over the seven seas and the beautiful continents the world has to offer! Will make a nice gift for the student of the world! 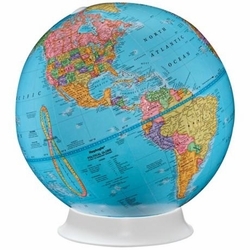 • Free mount globe with blue map color. • White plastic clear view base. • Political map with multi-color highlights.